Deadpool is a strange beast, an unconventional mix of over-the-top violence and unrelenting comedy. 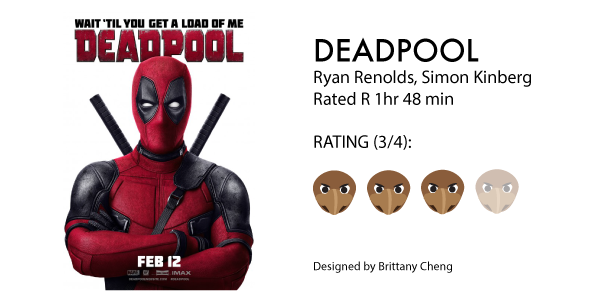 The titular character, played by Ryan Reynolds, spends most of the movie blowing brains out, slicing limbs off and making countless morbid jokes at his victims’ expense. In many ways, Deadpool is a nearly two-hour parody of the superhero genre, turning the traditional do-gooder hero into a foul-mouthed psychotic. The story is simple. Wade Wilson is an ex-special forces agent-turned-mercenary. He’s violent, rude and generally unpleasant to be around — not your typical hero. Shortly after meeting the love of his life, Wilson is diagnosed with terminal cancer. Desperate for a cure, he seeks out a shady organization, led by a man calling himself Ajax, that promises to both heal his cancer and turn him into a “superhero.” After a series of inhumane experiments, Wilson is cured of his cancer and endowed with incredible superhuman abilities. Unfortunately, he is horribly disfigured in the process. Feeling Ajax and his cohorts have wronged him, Wilson swears vengeance, dons a red bodysuit and rechristens himself Deadpool. And that’s about it. There’s no clever twist or new wrinkle to an old formula. Deadpool is simply a revenge story — The Count of Monte Cristo if Edmond Dantes wore spandex and swore a lot. Deadpool is a lot like a roller coaster: You know exactly where you’re going before you even get on, but that doesn’t make the ride any less entertaining. The character of Deadpool is really what brings this movie together. There is something incredibly entertaining about watching the classic superhero origin story play out from the perspective of a person who is decidedly not a hero. He kills, curses and generally acts like an unhinged child with superpowers. It’s refreshing in a way, a welcome break from the morally uncompromising heroes of other movies. The comedy can get tiring after a while, as Deadpool is always joking. Always. Every time the film seems like it’s about to get serious, he derails any drama by saying or doing some ridiculous thing. Deadpool is clearly a comedy, but humor is enhanced by contrast. A few legitimate moments of drama or poignancy give viewers a break from the comedy, allowing them to recover in a sense. But when the jokes never stop flying, it’s very easy for the humor to become irrelevant white noise. Fortunately, Reynolds’ performance as the antihero, depicting Deadpool as a wronged man just trying to reclaim his past in his own psychotic way, affords the character just enough depth not to fall into this trap. Deadpool is no masterpiece. The film’s two big fight scenes take place on a freeway and in a scrapyard, respectively. The villains are uncreative ne’er-do-wells with no motivations beyond “because we’re evil.” Deadpool is no masterpiece, but it is good fun. If you’re in the market for a unique and humorous take on the superhero genre, Deadpool delivers in spades.